Maximum loads offer magnum performance, yet less recoil than standard, less powerful JHP ammo. 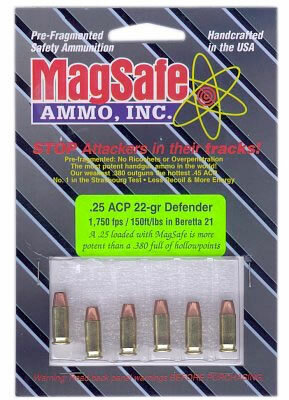 MagSafe ammo was designed with the concept of magnum performance with safety. The core is made of #2 or #3 shotgun lead pellets, in specific patterns, and stabilized by a custom blend of epoxy resins. Bullets can be designed for deeper penetration, wider wound channel, some even to break apart in sheetrock walls. The use of larger pellets definitely reduce the Ricochet Hazard, and because of its light weight, bullets are much faster with less recoil. MagSafe's revolutionary design uses large lead shotgun pellets rather than solid lead for a bullet's core. Early in the design process, hundreds of videotaped test shots were made into ordnance gelatin. Then, viewed in slow motion, you could see how a core's pellet size and pattern created the greatest wound damage for any given caliber. It was quickly learned that using much larger # 2 or # 3 shot gave perfect penetration depth in gelatin or flesh-form 10 to 13 inches (two to three times as much penetration as our competitors). A large man's chest is only 12 inches thick from front to back, and any more penetration was wasted energy that would endanger innocent people. That was the first goal reached - ammunition that won't overpenetrate a torso and hurt or kill innocent bystanders. MagSafe Ammo is faster, recoils less, and stops attackers faster than any other ammunition in the world. MagSafe works. It's expensive, but it works.